A few days back, a lovely tipster sent us in some shots that strongly suggest a shiny new Nexus 7 will be hitting shelves next week for $269. Granted, that's for the 32GB model, but it still represents a $20 premium over the current version. What we haven't known until now, though, has been what exactly that extra $20 will get you. A new leak, that photo above of a product info tag, suggests that there are actually quite a few extras baked in this time around. According to the pic, there's a quad-core 1.5GHz CPU with the still-unannounced Android 4.3 as the OS. The 7-inch screen size remains, though it's unclear if there's a resolution bump to accompany it. Also on board are a pair of cameras: 1.2MP up front and 5MP around back. The two more unexpected tidbits are the addition of Slim Port support for playing 1080p video on your TV, as well as wireless charging, because the less cables you need, the happier you're bound to be. We're sure all will be revealed next week at Google's big event. 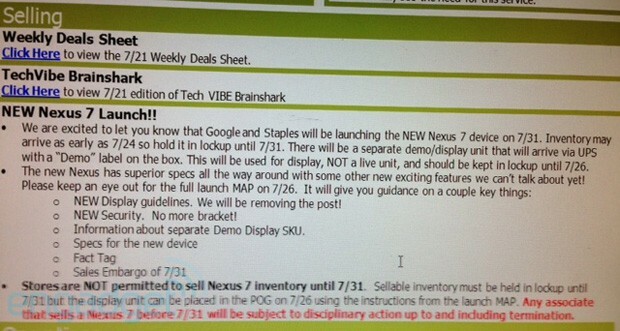 Update: Yet another tipster has reached out to us to share that the next iteration of the Nexus 7 will officially go on sale in Staples on July 31st. As you can see in the memo after the break the tablets are expected to arrive in stores as early as the 24th, but they'll be kept under lock and key until the last day of the month. This doesn't preclude Google from selling the devices through the Play store earlier, though, but that would mean taking the plunge without trying it out first.